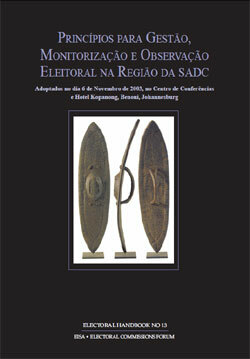 Principles for Election Management, Monitoring and Observation in the SADC Region (PEMMO), 2004. The document is structured in such a way as to reflect the chronology of events in the management of elections. it begins by discussing the requirements for a sound political and contitutional dispensation that will give birth to an election regime and its supporting electoral institutions. Some recommendations are giving in the document of the electoral process : the pre-election phase, the election phase and the post-election phase. Provides a comprehensive account of the first two decades of inclusive and competitive elections in the region. Covers the period 1989 to 2009 and focuses on 14 countries showing that elections took root and increasingly occurred at regular intervals. In most cases electoral management increased in quality. Yet behind the veil of frequency, there is the reality of an uneven quality of elections. The study identifies trends and highlights the progression and regression of elections. This compendium is a unique collection of baseline information on each of the SADC countries. It draws on analysis of each country in the Southern African region with each contribution organised according to an easy reference format. Topics include the voter registration process, electoral systems, electoral administration, civic education, and more. Comparative information such as geographic and socio-economic data is also included. Voter Registration in Africa: A Comparative Analysis,Astrid Evrensel (ed) 2010, EISA. The first part of the book provides an overview of different voter registration methodologies. It identifies guiding principles for voter registration and the latest technologies in teh industry. The second part is devoted to country study reports - The Democratic Republic of Congo, Liberia, Malawi, Mozambique, Ghana, Rwanda, Senegal and South Africa. South Africa's Founding Democratic Election 1994: A Select and Annotated Bibliography, Beth Strachan 2005. Bibliograpy comprising 1101 annotated entries, compiled in 1999. It refects current preoccupations, the electoral process itself, preparations for the election, challenges and difficulties faced by the Independent Electoral Commission, the importance of the chosen electoral system, its implementation and consequences; the election results, their analysis, interpretation and correlation with political and opinion poll forecasts. South Africa's Second Democratic Election 1999: An Annotated Bibliography, Beth Strachan 2001. Books, pamphlets, periodical articles, reports and conferences are included, newspaper articles are not. It is based on the stock of the Electoral Institute of Southern Africa's own library, reflecting its focus and direction. Additional source material has been gleaned from the records of the Africa Institute, the Human Sciences Research Council, the South African Institute of International Affairs and the University of the Witwatersrand as well as from relevant data bases. Manuel à l'usage du formateur en observation électorale citoyenne, 2016. Case Digest: Decisions of the [Kenyan] IEBC Dispute Resolution Committee, 2014. Tsad: Formation des formateurs en observation électorale: Manuel du participant, 2011. Tsad: Rôle et responsabilités de l'observateur; code de conduite, 2011. Tsad: Planification, déploiement et coordination d'une mission d'observation électorale: Guide à l'attention des organisations de la société civile, 2011. Tsad: Formation des délégués des partis politiques dans les bureaux de vote manuel à l'attention des états-majors des partis et des candidats, 2011. 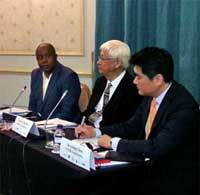 To assist observer missions from SADC countries, ground rules are determined and operational tasks are identified. The electoral process must be judged according to the integrity, credibility, transparency, inclusiveness, freeness, fairness, as well as voter' understanding of their rights and ability to exercise these rights in an enabling environment.